The blind marking setting allows the graders of a course assignment to see the assignments that have been submitted without seeing the students name attached to it. After grading the assignments, the blind setting can be turned off to reveal the students' names so the grades can then be released to the students. 1. Select the assignment that you would like to grade. 2. Click View/grade all submissions under the grading summary options. 3. 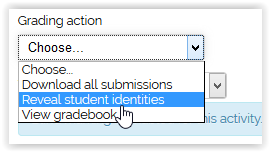 Click on the Grading action drop down box and select Reveal Student Identities. 4. Click continue to reveal the identities for the assignment.